Earlier last week Golden Knights defensemen Shea Theodore talked about what the team learned from last year’s second round series against the San Jose Sharks. 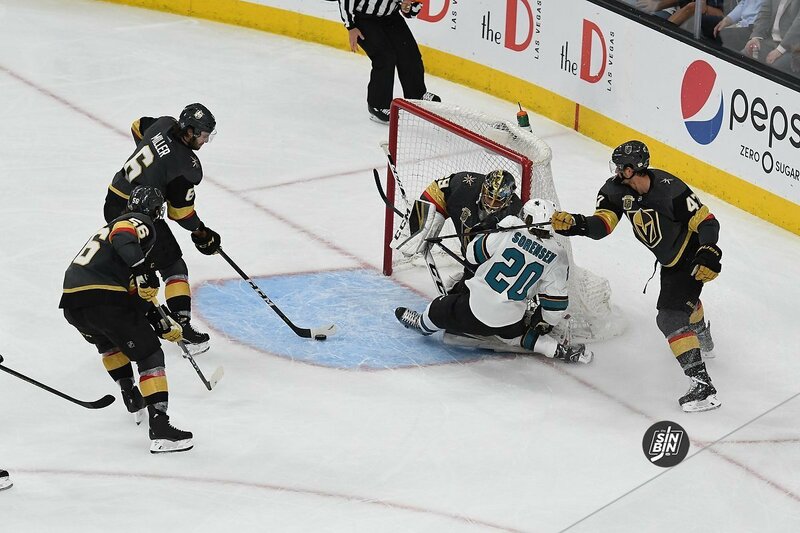 One of the elements to the Sharks game last season was to crowd the open space in front of goaltender Marc-Andre Fleury, and boy did they ever do it again in Game 1. As Theodore mentioned, Tomas Hertl, Joe Pavelski, Evander Kane and Logan Couture were, and still are, tough to handle. San Jose tried circling around and camping out in front of Fleury, but thankfully for Golden Knights fans, the Golden Flower was superb. On Wednesday night, the tables were turned. Sharks players spent a majority of the night camped out in front of Fleury and the Golden Knights couldn’t clear players out of the “bubble.” The area from the crease and extended out a few feet has to be locked down if Vegas wants to keep the Sharks off the board as the series continues. Coach Gerard Gallant spoke about the Sharks tight down low-pressure yesterday at his daily press conference. So, what’s the adjustment for Game 2? While we all watched Fleury make amazing saves series after series last season it’s tough to expect him to do it again. He’ll need less traffic and double parked Sharks in his zone. If his teammates can do a better job of sealing up the bubble in Game 2 they’ll have a great chance to even the series.